The mountain roads of the Isle of Man on a wet spring morning are a long way from the glitz and glamour of the Champs-Elysees in July or the chaos and confusion of a race grid in Indianapolis or Mugello. But it is here you may find two world-class British sportsmen hitting the slopes in preparation for very different seasons. One of them is MotoGP rider Cal Crutchlow, who last season as he took two third-placed finishes aboard his Tech 3 Yamaha. The other is 23-time Tour de France stage winner and 2011 BBC Sports Personality of the Year Mark Cavendish. "In the winter I basically turn into a professional cyclist," Crutchlow told BBC Sport. "I live on the Isle of Man when I'm not travelling around the world racing, and that is where Mark is from. "It's only a small island and you soon get to know everyone. We met a few times out on our bikes and now, whenever me and Mark are both in the Isle of Man we train together a lot. I try and go and see him race when he's in Europe and he comes to watch a few MotoGP rounds if he can. "I ride a lot with Mark. There is a big mutual respect between us, we both love each other's sports. It crosses over well and we are good friends. "I've never beaten him in a race yet - but if I had my MotoGP bike out there I might stand a chance!" After finishing the 2012 season in seventh overall, Crutchlow wrapped up last year before decamping to Carlsbad in California for the best part of two months. It's part holiday, part training camp for Crutchlow, who estimates that he spent 104 hours cycling during December alone. "It's perfect in California during the winter, the weather seems to be good all year round and it means I can train," Crutchlow said. "I'll go back to my place on the Isle of Man at the end of February and then I can toughen up with the wind and the rain and the snow. "I have had problems with my knees over the years, I can only run a few times a week so I tend to cycle. "There are some great bike riders on the Isle of Man. I ride a lot with former pro Andrew Roche, he's my coach if you like. I get out on the grim days with Andy. Four hours in the wind and rain is tough going on the island but it's good fun. "Cav's list of achievements is fantastic, he can definitely ride a bicycle. "We give each other a hard time on the bike. I train just as much as a pro cyclist so my level is not too bad, and while I'm never going to beat Cav, it's excellent training. "I've not got him on a motorbike yet, I'm trying but he likes his Vespas. "I might try and get him on the back of one of my bikes for a few laps at the British Grand Prix at Silverstone this summer, I reckon the crowd would like that." 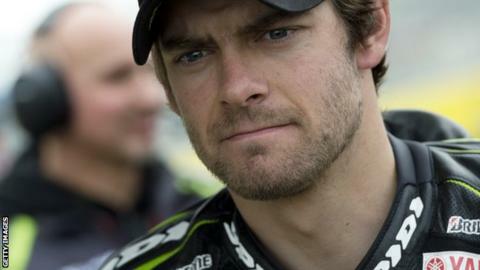 Crutchlow will be in an all-British team in 2013 at Tech 3 with Bradley Smith. Smith, who is also a keen cyclist, but admits he is not in Crutchlow's league. "Cal could turn professional as a cyclist - I've got no doubt about that," Smith told BBC Sport. "He puts so many hours in on the bike. I have to spend all my time in the gym now but he is a different build." The MotoGP season begins with testing in Sepang, Malaysia on 5-7 February, with the first race in Qatar on 7 April.